This heavily worn bronze axehead was recently found at Auldearn near Nairn. It is a type from the early Bronze Age (c. 2250-c. 1900 BC), cast in open moulds such as those found at nearby Culbin Sands. Although possible for utilitarian use, axeheads of this type were often polished smooth, functioning as symbols of power. 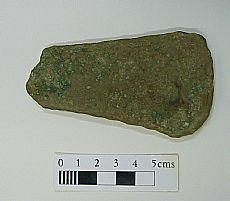 As such they continued the tradition of the polished Neolithic stone axeheads (see Find of the Month, April 2010 ). This axehead is in Inverness Museum, although not on display. •	A middle bronze age hoard from Inshoch Wood with a portable anvil, hammerhead and scrap spearhead (HER id MHG7060). This is on display in Inverness Museum. 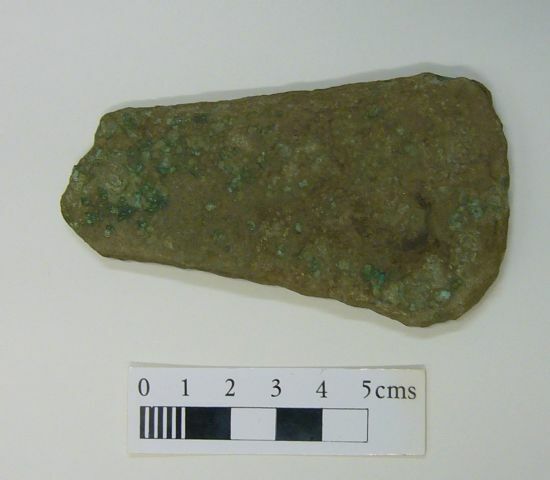 Taken together these finds show that Bronze Age people had access to metalwork, indicating rich and high status people living in the area. The Inshoch Wood hoard is particularly important because it shows that people in the area were working bronze. The raw materials are likely to have been imported, copper from Ireland and tin from Cornwall. The Bronze Age metalwork from Auldearn parish was researched by Irene Mackintosh as part of the ARCH Community Timeline course held in Auldearn in autumn 2010. During March 2010 the Community Timeline display illustrating the results of the class’s work will be in the Dunbar Hall, Auldearn. 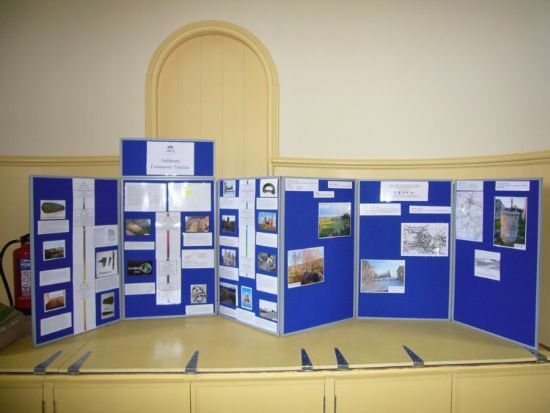 On Thursday, 3rd March the newly established Auldearn Local History/ Archaeology Group will have a coffee afternoon, 2-4pm, where the display and related binder can be seen. John M.Coles 1968-1960. Scottish Early Bronze Age Metalwork. Proceedings of the Society of Antiquaries of Scotland 101, 1-110. Also available on-line. Trevor Cowie 1988. Magic Metal. Early Metalworkers in the North-East.